It is very important that your child gets the proper amount of calories and nutrients in order for him/her to function at an optimum level. The amount of calories and servings of food that your child needs every day is based on several factors; age, gender and activity level. The more active your child is, the more calories he or she needs. Males generally need more than females and usually older children need more calories than younger children. If your child is sick or has a medical condition, the calorie requirement can change so it is always best to seek professional advice in these situations either from a certified nutritionist or a medical doctor. Click here to find out the daily nutrition requirements for your child. Research has found that children are not getting enough essential nutrients so these are important to keep in mind when planning your child’s diet. Promoting fruit and vegetables consumption is essential for good health both now and in the future. As a nutritionist for 20 years and a mom of two, if I could wave a magic wand and make one change in the way most kids eat, it would be to make sure they get a minimum of 5 servings of fruits and vegetables every day. An easy way to remember this is to serve a fruit and vegetable at each meal and one at snack time. Click here to see how you can offer fruits and vegetables over a typical day. Fruit and vegetable consumption has been shown to prevent certain forms of cancer and heart disease. They provide many nutrients and the necessary fiber that children need. Having your child fill up on produce will keep them from snacking on high- calorie, but empty nutrient varieties of junk food. 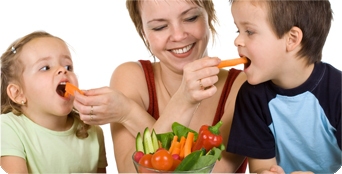 It is hard to binge on fruits and vegetables as the fiber has a satiating effect; kids will stop when they feel full. With junk food, the salt and sugar present cause an addictive eating response whereby the child continues to eat and eat, never feeling satisfied. The majority of children does not get enough vegetables in their diet and most certainly do not get the variety they need. The number one vegetable consumed is white potatoes and many times these are prepared in a unhealthy way, which takes away the benefits. The top fruits consumed by kids are apples and bananas. Children need to eat a rainbow of colors in order to get the complete advantage of the many vitamins, minerals and phytonutrients that are present in different amounts. Try offering berries and tropical fruit as a change and green leafy (sauté in olive oil with soy sauce for a yummy alternative or chop up finely in soups) and orange vegetables (next time you make mashed potatoes use 1⁄2 white potatoes and 1⁄2 yams or sweet potatoes). Click here for help in choosing the best fruits and vegetables. Most babies enjoy eating pureed vegetables and fruit. Continue to encourage your child’s enjoyment by offering many varieties through the various stages of growing up. If your child complains that they no longer like a particular vegetable tell them that “it likes you” and continue to offer it. Also try planting a garden. Gardening teaches children where food comes from and it helps to get them excited about produce to the point where they will be more likely to eat it. Even those living in apartments can plant tomatoes and herbs on their terraces or at a nearby local neighborhood garden plot. Check out areas by you. Calcium is an essential nutrient that is used to build strong bones and teeth so it is especially important that your child gets enough calcium in their diet during the crucial growing years. By the time children reach young adulthood, their bones have formed. If your child’s intake before the age of twenty was inadequate, they run the risk of forming softer and more brittle bones which puts them at risk for fractures and osteoporosis later in life, especially for girls. It is important for your child to understand that they can not make up for an inadequate intake later in life, after their mid 20’s all they can do to promote “bone health” is to prevent calcium from being lost from their bones as they age. Children in the United States get the majority of their calcium needs from dairy products, but if your child does not like, or can not tolerate dairy, don’t worry as there are numerous other calcium sources. Fortified fruit juices, soy milk, leafy greens, white beans, almonds, canned salmon, and sardines with bones are just some examples of these. In the past 30 years soda consumption has risen while milk consumption has dropped and this has left our children vulnerable to developing weak bones. In fact 87% of girls and 64% of boys between the ages of 9 and 13 do not get enough calcium in their diet. Encourage children to drink a glass of low fat milk with every meal or some other calcium source that provides 200-300mg of calcium. The table below lists the amount of calcium that a child needs every day. Also make sure that children get 400 IU’s of vitamin D daily because this vitamin is needed to absorb the calcium in their diet. When sunlight hits our skin, it turns the cholesterol within the skin into vitamin D. Since the beginning of time, people did not need to be aware of this essential vitamin or if they received enough of it, as long as they spent time outdoors. These days there are numerous warnings provided by many sources about risks for skin cancer with unprotected sun exposure. As parents we are left needing to decide what is worse; increasing our child’s risk for skin cancer by letting them get sun exposure without sunscreen (you can’t make vitamin D if there is sunscreen blocking the sun), or running the risk of our child becoming vitamin D deficient. While many parents are aware of the risk of skin cancer from too much skin exposure to the sun, relatively few parents are aware of the need for adequate vitamin D levels. There is a need to be concerned about vitamin D, because the majority of children have insufficient blood levels. Children who have deficient vitamin D levels have higher blood pressure and blood sugar levels and lower levels of the good cholesterol they need. This can then lead to heart disease and diabetes if it occurs over a long period of time. The reason that the majority of children are not getting enough vitamin D is probably due to a decline in the amount of milk children drink and the increased use of sunscreen. In light of recent research findings regarding the safety of vitamin D supplementation and the widespread prevalence of vitamin D deficiency, the American Academy of Pediatrics has determined that it is safe for children to take supplements of vitamin D.
They doubled their guidelines recently, recommending that all children, starting soon after birth, take a supplement of 400IU’s of vitamin D unless they are drinking 32oz of formula or milk fortified with vitamin D.
The reason it is difficult to prescribe “sun” instead of “supplements” is due to the uncertainty surrounding the dose of vitamin D that your child can make when they are exposed to the sun. • being dark skinned because those individuals with a darker complexion do not make vitamin D as efficiently as those with light skin. Talk with your child’s pediatrician and determine what is best for your child; sun exposure, supplementation or a combination of both. You may live in an environment where your child can obtain enough vitamin D year round, while for others some sun exposure during the summer and spring months (but not during peak time of 10AM – 2PM when the risk of a sunburn is great) is adequate. Since vitamin D is essential for growing strong bones and keeping your child’s immune system strong, it is important to make sure your child obtains the 400 IU’s a day that they require. Make sure a fruit and vegetable are offered at each meal and one at snack time. Eating more whole grains, legumes, nuts, fruits and vegetables daily will provide your child with the essential nutrients that are lacking in their diets. An Average Day (1600 calories) Click here to determine how many calories your child needs a day and make adjustments if it is over or under 1600 calories. If servings in each food group become confusing, count out the number of servings in each of 5 different colored poker chips, marbles, or other item. Place a chip/marble in a jar each time you serve a portion of that food group. A sandwich would equal 2 grain and 1 meat so you would place 2 green and 1 red chip in the jar. This makes it easy to see what is left for the day and it is a fun activity that you can do with your child. Get your child in the kitchen to help prepare meals and snacks. They need to learn how to prepare food. Plus, it teaches them math skills. Have your child select which types of fruit, veggies, meat and grains that he or she would like from the selections in each food group. If they have a say in the meal and snack, they will be more likely to eat it.